Time to update you on the diary dates so far for this coming year so if you live nearby, hopefully you and your family can pop along and say hello and join in the fun. As always, I would be love to visit your Church to do a concert / praise party / all age service, and as you can see, there are still plenty of free dates. Also if your Church is within 50 miles of anywhere I am visiting, on either the day before or the day after I would love to come and visit you. After travelling a distance it makes sense for me to visit as many Churches as I can whilst in that part of the country, and I can provide all the equipment I require. The cost to the organiser would only be £100. Please e mail me for more info ishmael@ishmael.org.uk. March 23rd/ 24th Enfield. 28th Bridlington. 29th Bishop Auckland. April 11th-14th Spring Harvest Minehead. 16th-17th Skegness. May 11th-12th Swindon. 19th Alfold. June 1st Warwick. 19th Axminster. 20th St Minver. 21st Bristol. September. 13th Littlehampton. 20th Weston-Super-Mare. October. 5th Chiddingfold. 11th Luton. November 1st Felpham. 3rd Chiddingfold. More details of each booking on my website diary. Wednesday I’m at St Peters Church in Martley doing a special rendering of my ‘When the road is rough and steep’ concert for their Lent event. Thursday I’m doing a radio interview for Heart and Soul radio followed by a ‘Sting in the Tale’ testimony concert at Catshill Baptist Church in Bromsgrove. Saturday I’m at St Andrews Church in Crawley along with Duggie Dug Dug doing a seminar and Praise Party for childrens leaders. Then on Sunday morning I’m preaching in Chichester Cathedral on Luke 14 v 33 when Jesus said ‘Anyone who does not give up everything they have cannot be my disciple. I love diversity and challenge and next week is certainly going to be that! They say variety is the spice of life…well if it really is spicy…I’d rate this as a vindaloo of a week approaching! I’ve noticed that one or two are having difficulty making payment at our online shop. Just doing my final preparations before I visit South Wales tomorrow. At 6.30pm on Saturday I will be at Lliswerry Baptist Church Newport Gwent NP19 0JF. Here I will be doing the ‘Scripture Song Concert’. Loads of songs! Loads of singing! And of course…loads of fun for all ages! Approx 90 minutes long, admission free but an offering will be taken to help support my on going ministry. Then on Sunday morning at 10.30am I will be at Alc Newport 124 Lower Dock St. Here I will be leading an all age celebration. There will be lots of singing and I will also be sharing a little bit about healing and praying for any who would like prayer. At 6.00pm Sunday I will be at Gosen chapel 31 Bute St Treorchy Rhondda. Another all age celebration, again with plenty of singing but this time i’ll be giving testimony and sharing a bit on how to cope when the road gets rough and steep. I do hope to see some of you ‘locals’ this weekend as it’s my first visit to Wales for years! 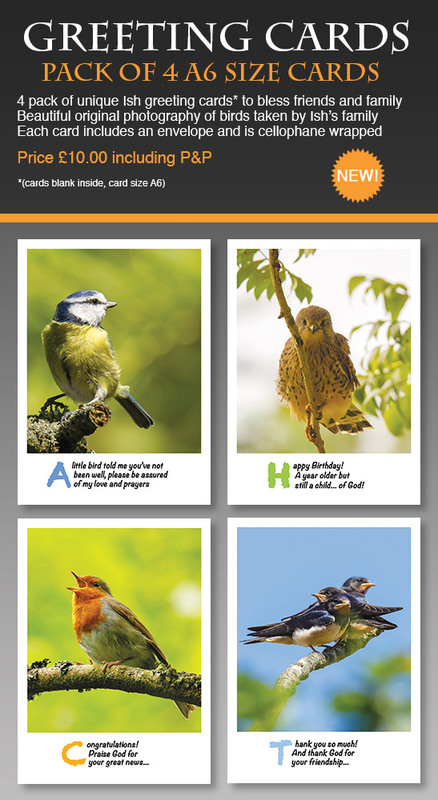 For online sales it was easier for us to reduce the cost of the cards to £6.00 then add on the website shops set amount for P&P of £4.00.This means that UK buyers are really getting the cards P&P free. Ishmael and Irene are patrons of 'Education Plus' who do wonderful work amongst the poor children in Costa Rica.